Noise Level Range: Below 75 db . TECHANICAL DATA CAPACITY : 130 TO 3000 m3/hr. - High Vacuum upto 0.01 mbar or better. - International design compliance to API/ISO/BS/CE certified standards. - Advance technology Double sealing system for leak proof design. The DS pump is a 24V DC electrically operated, piston pump, intended for pumping lubricating grease in small progressive systems. With its compact design, and disposable grease cartridge, it will integrate into a machine tool perfectly. From our wide consignment, we are offering to our patrons an optimum class variety of K Dry Vacuum Pump. Application - Product Distillation, Drying, Transformer drying & Oil charging, Etc. Screwline vacuum pumps are dry compressing backing pumps, the operation is based on the screw principle. 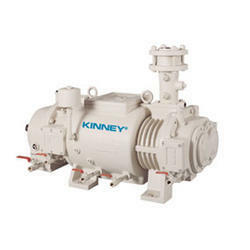 Being a popular firm, we are providing Screw Vacuum Pump. Our series is widely employed by our clientele owing to high strength and longer life. We are leading Suppliers of NASH Dry Screw Vacuum Pumps. 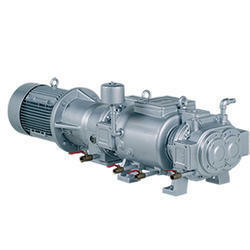 This Oil Sealed Screw Vacuum Pump can be deployed for multiple industrial applications. - Capacity: Upto 3500 M/ Hr.